1 Department of Molecular Medicine, CMRI, Exosome Convergence Research Center (ECRC), School of Medicine, Kyungpook National University, Daegu 41944, Republic of Korea. 2 Department of Biochemistry and Cell Biology, School of Medicine, Kyungpook National University, Daegu 41944, Republic of Korea. 3 Department of Microbiology, School of Medicine, Kyungpook National University, Daegu 41944, Republic of Korea. 4 Research Institute of Pharmaceutical Researches, College of Pharmacy, Kyungpook National University, Daegu 41566, Republic of Korea. 5 Department of Immunology and School of Medicine, Keimyung University, Daegu 42601, Republic of Korea. 6 College of Pharmacy and Research Institute of Pharmaceutical Sciences, Seoul National University, Seoul 08826, Republic of Korea. 7 Chuncheon Center, Korean Basic Science Institute, Gangwon-do 24341, Republic of Korea. 8 Department of Biochemistry, College of Natural Sciences, Kangwon National University, Gangwon-do 24341, Republic of Korea. 9 Drug & Disease Target Group, Korea Basic Science Institute, Cheongju 28119, Republic of Korea. 10 College of Pharmacy, Chung-Ang University, Seoul 06974, Republic of Korea. 11 College of Pharmacy and Gachon Institute of Pharmaceutical Sciences, Gachon University, Incheon 21936, Republic of Korea. 12 Section of Molecular Pharmacology and Toxicology, Laboratory of Membrane Biochemistry and Biophysics, National Institute on Alcohol Abuse and Alcoholism (NIAAA), Bethesda 20892 MD, USA. *Correspondence and requests for materials should be addressed to M.-C.B. Inhibitors of the secretion of cancer exosomes, which promote cancer progression and metastasis, may not only accelerate exosome biology research but also offer therapeutic benefits for cancer patients. Here we identify sulfisoxazole (SFX) as an inhibitor of small extracellular vesicles (sEV) secretion from breast cancer cells through interference with endothelin receptor A (ETA). 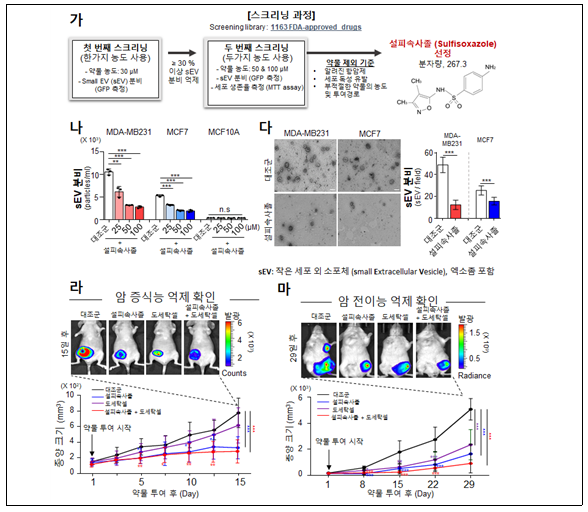 SFX, an FDA-approved oral antibiotic, showed significant anti-tumor and anti-metastatic effects in mouse models of breast cancer xenografts, the reduced expression of proteins involved in biogenesis and secretion of sEV, and triggered co-localization of multivesicular endosomes with lysosomes for degradation. We demonstrate the important role of ETA, as target of SFX, by gain- and loss-of-function studies of the ETA protein, through a direct binding assay, and pharmacological and genetic approaches. These findings may provide a foundation for sEV-targeted cancer therapies and the mechanistic studies on sEV biology.